In the demanding world of helicopter operations, getting the job done is priority No. 1. To meet the challenge, you want equipment that’s reliable, adaptable, affordable and safety enhancing. 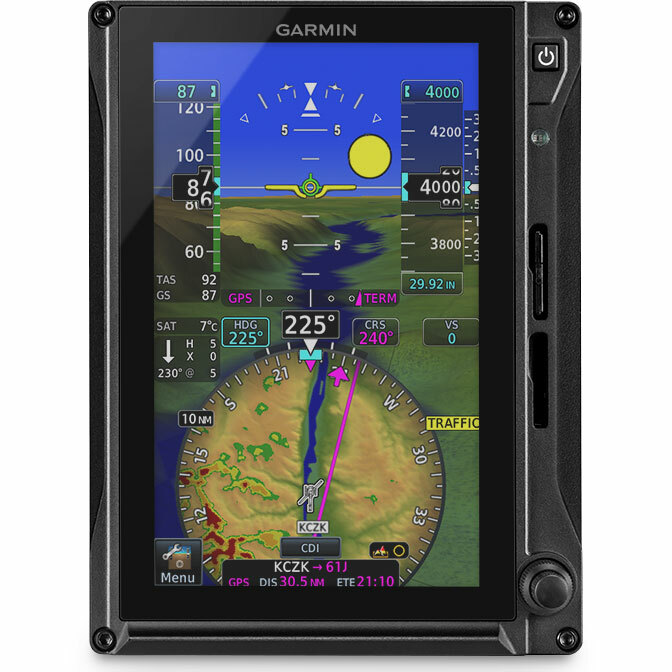 And that means you want what Garmin’s latest G500H TXi electronic flight display systems deliver. Designed specifically for FAR Part 27 helicopters, the systems’ clean-sheet touchscreen designs and dual-core processing power build on the proven capabilities of Garmin’s original G500H glass flight display series to offer you a vastly expanded array of features, options and panel layout possibilities. 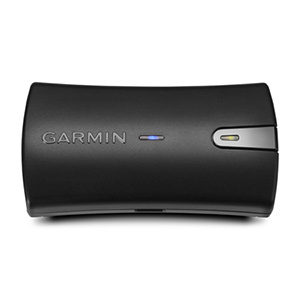 Backed by Garmin’s No. 1-ranked product support team, G500H TXi makes it easy to configure a robust glass cockpit solution that fits your mission today and can grow with your needs for the future. Bright LCD touchscreen displays, available in 7” or 10.6” formats, offer a variety of installation configurations to fit your available panel space and budget. 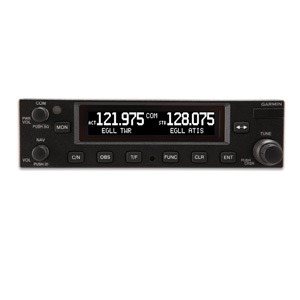 The 10.6” horizontal format can accommodate Primary Flight Display (PFD) information and a Multifunction Display (MFD) side by side within the same unit. 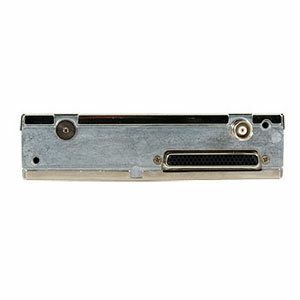 The display is pilot-selectable for PFD or PFD/MFD presentation. And the PFD/MFD option is configurable to be split 60% PFD and 40% MFD — or 40% PFD and 60% MFD to allocate more room for maps or other features you want to see most prominently. Similarly, the 7” portrait format displays can be individually dedicated to PFD (with HSI map) or MFD functions. 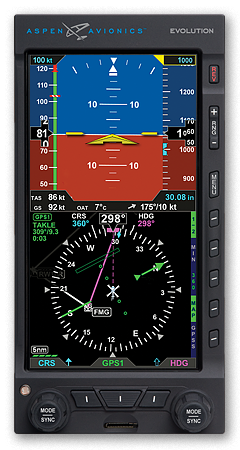 Another option, where panel space is limited, allows the 7” landscape format display to serve as a dedicated PFD with instrument tapes, a half-arc HSI (without the HSI map) and Garmin’s optional HSVT 3-D synthetic vision. In configuring your system, you can mix and match up to 2 of the high-resolution touchscreen displays in your cockpit. For added versatility and convenience, you can use the traditional concentric knobs — or opt for touchscreen inputs — to access most control functions on these units. Plus, for helicopters already equipped with the original G500H series flight displays, full TXi compatibility with existing system sensors makes for an easy, cost-effective upgrade path. In addition to the already extensive databases found in its fixed-wing counterpart, every G500H TXi system uses a helicopter-specific obstacles database featuring more than 200,000 additional low-altitude obstacles. For added protection, an expanded version of this database features more than 700,000 miles of power lines. This allows for additional visual reference in low-level operations, where Garmin’s WireAware™ wire-strike avoidance technology uses this database to overlay power lines on the map displays and provides audible alerts to help pilots recognize potential wire-strike hazards in proximity to the flight path. To support night operations, each display is optionally available with NVG compatibility. And for increased operational capability, the system also supports multiple video input options that enable the MFD to serve as a FLIR or live-cam video monitor. When darkness, fog, rain, haze, blowing dust, swirling snow or inadvertent flight into IFR conditions keep you from seeing the “big picture” clearly, Garmin’s safety-enhancing HSVT synthetic vision technology can make a world of difference. 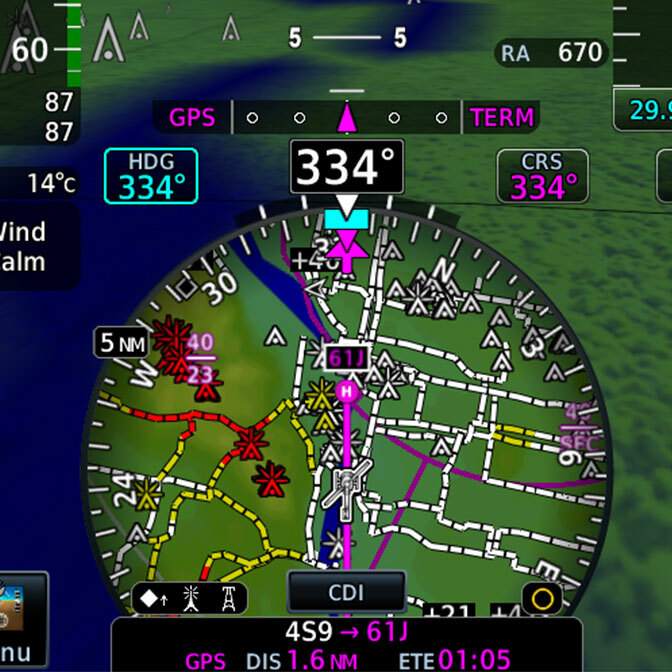 This optional capability, available on all G500H TXi PFD displays, helps minimize visual impairment by providing a virtual reality landscape on your flight display, showing a database-generated view of ground and water features, airports, obstacles, traffic and more. The HSVT depictions look so real, it’s like having a clear-day “out-the-window” view of your flight situation — even when actual conditions are less than ideal. What’s more, towers or obstacles that may encroach upon your flight path are color highlighted and clearly displayed with height-appropriate symbology. For the ultimate in hazard avoidance solutions, G500H TXi supports high-resolution, five-color HTAWS when it’s paired with an HTAWS-equipped GTN or GNS™ series navigator. Using WAAS GPS position information compared with the system’s internal databases, the HTAWS offers forward-looking avoidance capability to predict in advance where potential hazards may exist and help you maintain safe separation from nearby terrain, towers or obstacles. Accompanying voice alerts also indicate the relative threat level, with messages such as “Caution, Obstacle, Obstacle” or “Warning, Terrain, Terrain” — as well as keeping you apprised of your aircraft’s height above ground when descending below 500’. However, if your mission requires routine operation in close proximity to known terrain or obstacles, Garmin’s pilot-selectable Reduced Protection (RP) mode allows you to minimize alerting interruptions. And for even more terrain awareness, add Garmin’s GRA 55 radar altimeter to display your AGL readout on your G500H TXi display. To provide even more situational awareness, G500H TXi includes HSI mapping capabilities on the 7” portrait and 10.6” display configurations. 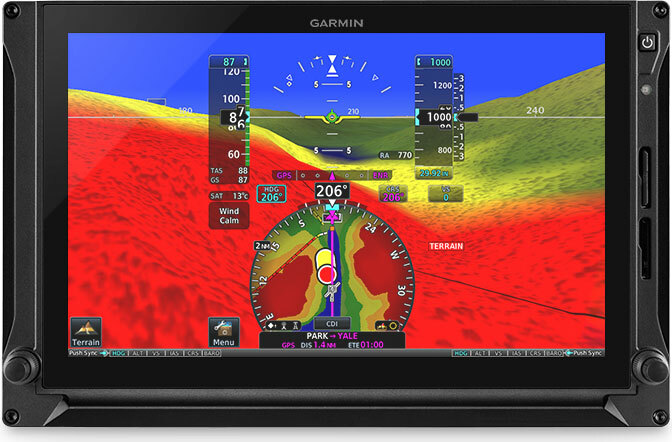 This technology puts an MFD-like perspective map view within the HSI portion of your PFD. In addition to the geographical map, the HSI map view can also support the overlay of NEXRAD imagery and weather inputs from ADS-B and SiriusXM® datalinks. Additional overlays include SafeTaxi® airport diagrams, WireAware power line avoidance, traffic, terrain and more. 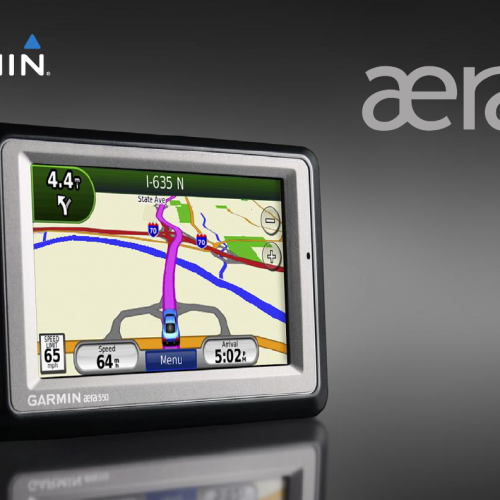 HSI map control and on-screen navigation are a snap, thanks to a Garmin innovation that lets you zoom in or out on the map by using a simple and natural single-finger swipe gesture. G500H TXi was designed to interface with a wide range of avionics equipment, including Garmin’s digital GFC 600H helicopter flight control system. The GFC 600H provides a more stable flight platform that helps to significantly reduce pilot workload, fatigue and stress levels in busy “hands-full” situations. 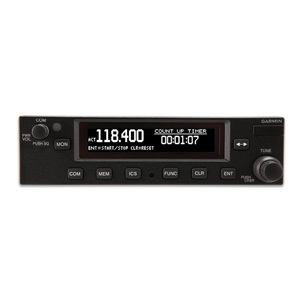 You can use the G500H TXi touchscreens for control/display of heading, course and navigation source inputs as well as mode annunciations and more (with compatible inputs). If you prefer, there’s also an optional dedicated PFD controller (with concentric knobs) available for the system. 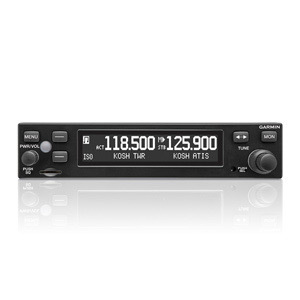 In addition, G500H TXi offers advanced integration capability with GTN series navigators, providing full touchscreen continuity between the navigation, communication and flight display functions in your panel. For added capability, G500H TXi seamlessly integrates with a variety of optional sensors and datalinks to support the latest in weather and traffic monitoring. 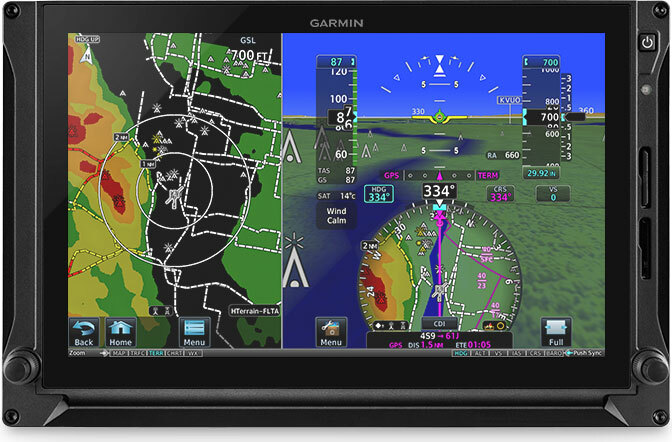 Garmin’s Doppler-capable GWX™ 70H onboard color radar features a reliable, solid-state design as well as optional turbulence detection and ground clutter suppression capabilities. For pilots flying in the U.S., Garmin’s GTX™ 345 series of all-in-one ADS-B transponders provide easy access to subscription-free ADS-B weather and advanced dual-link traffic services. Plus, by installing a GDL®69A satellite receiver with your system, you can add ground-and-airborne-accessible SiriusXM satellite weather and audio entertainment channels to the mix (subscriptions required). 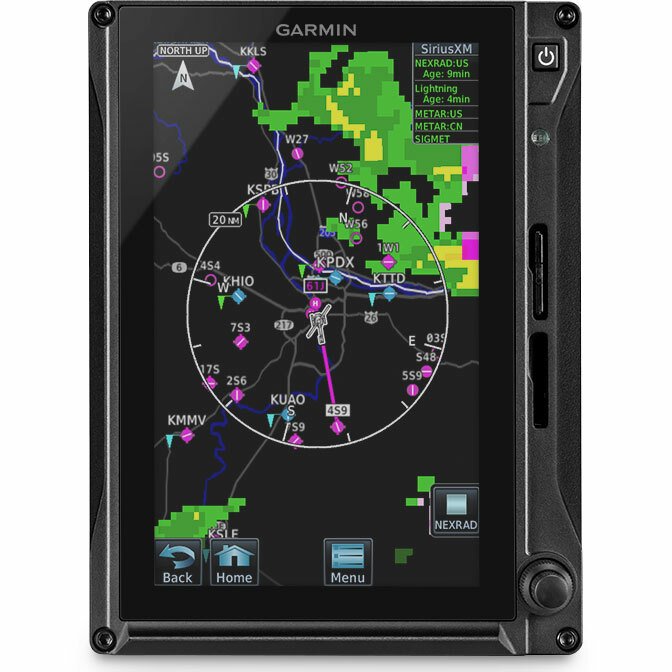 For a worldwide datalink solution, Garmin’s GSR 56 datalink provides weather data and radar imagery through the Iridium® global satellite network. And for even more advanced traffic surveillance in high-density airspace, G500H TXi integrates with select TAS or TCAS systems, including Garmin’s GTS™ family of traffic surveillance products. For even more ease-of-use functionality, team your G500H TXi displays with a GTN 650 or GTN 750 series navigator and Garmin’s Flight Stream 510 wireless gateway¹. This setup enables Garmin’s Connext wireless cockpit connectivity, letting you stream information in real time between your avionics and compatible mobile devices running the Garmin Pilot™ or ForeFlight Mobile apps. With this wireless mobile interface, you can use your tablet or smartphone to plan your flight, and then easily transfer the data to your avionics once you get to the aircraft. This saves valuable ground time so you can be ready for liftoff quicker. You can also stream weather, traffic, backup attitude information and more from your avionics to your compatible device². 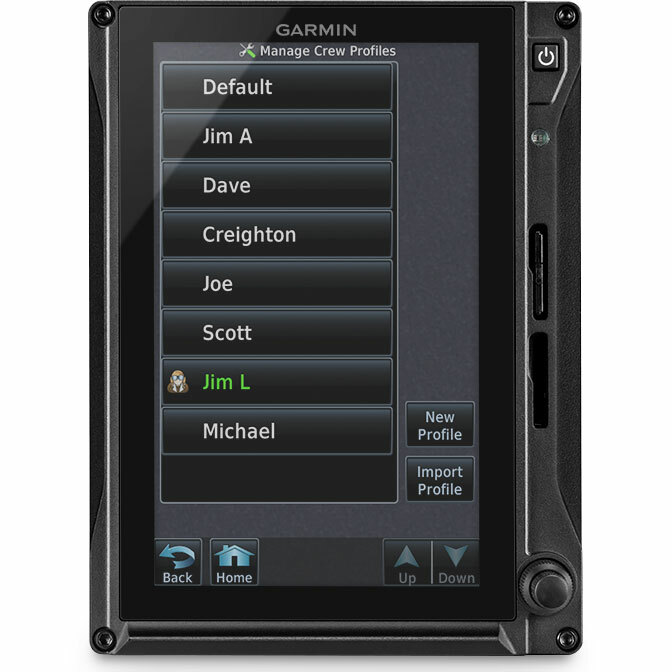 Plus, by using Database Concierge via Flight Stream 510, you can wirelessly transfer aviation databases downloaded to the Garmin Pilot app on your mobile device to your GTN 650/750 and G500H TXi system. For extra security in systems where multiple displays are installed, G500H TXi is designed to enter a reversionary mode — allowing another display to present essential flight instrumentation in the unlikely event of the PFD failing or shutting down. The displays have backup GPS receivers built-in as well, providing redundancy in the event your system’s primary GPS navigator ever fails. To help you keep things the way you like them, your individual pilot profile settings on G500H TXi can be saved³ within the system or loaded onto a removable SD™ card. This also means you can take your settings with you to another G500H TXi-equipped aircraft. Pilots operating within a flight department will especially appreciate this feature. Your preferred settings for backlighting, map settings and more can all be configured under your individual profile — allowing you to easily restore your system preferences prior to each flight, so you can be ready for lift time in less time. With installation approval soon to be available on several popular helicopter models, equipping your cockpit with G500H TXi is a straightforward, all-bases-covered proposition. You can select from a wide range of display configurations. And no matter which installation you choose, you’ll be flying with the peace of mind that comes with an industry-leading two-year warranty (and optional FlightLevel Select Extended Warranty), backed by Garmin’s award-winning product support team. Contact us to get on board with a G500H TXi installation or upgrade for your helicopter.